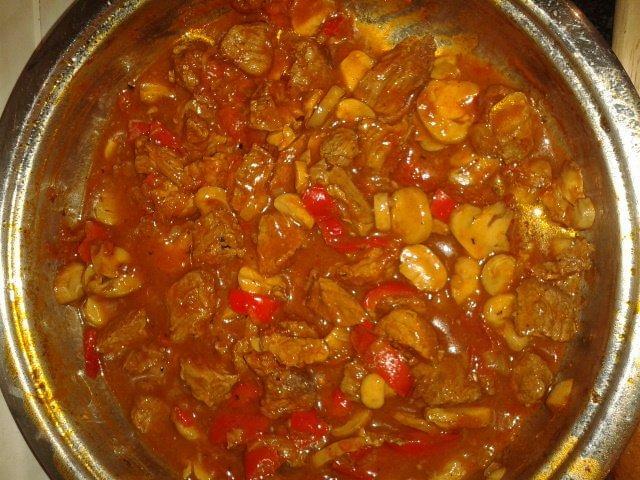 This is an original German Goulash recipe or paprika beef stew with red pepper and mushrooms (in German Gulasch or Rindsgulasch). It is one of the ebst goulash variations and I got it from my sister-in-law from Germany. It is an authentic German recipe, proven and easy to make. Happy Cooking! - Heat oil in a skillet; fry meat briskly bit by bit (don't use it all at once); when all meat is browned take off the skillet. - Chop onions finely, saute them until transparent in the same skillet. - Cut red pepper in fine stripes, add to onions and saute them. - Add meat, spice with salt, pepper and mild red paprika powder. - Add 2-3 tbsp tomato past, fill up with some water (1/2 cup or less; should not be too thin). - Reduce heat and let it simmer for 1.5 - 2 hours until meat is soft (depends on the meat). - 10 minutes before the end of cooking time add sliced mushrooms. Serve with your favorite pasta or rice.